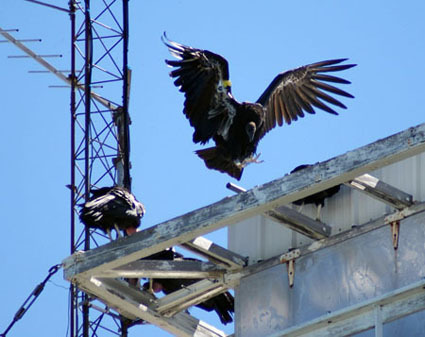 Five California condors made a historic fly-by and stopover at the UC Lick Observatory atop Mt. Hamilton earlier this week. Mountain residents recalled the visit was the first in at least 30 years, said John Wareham, who lives on the mountain and is deputy director of operations for Lick Observatory managed and operated by UC Santa Cruz. The giant scavengers were first spotted Tuesday, June 21, and also visited the next day, he said. Lick staff members watched in awe and captured dozens of images as the birds flew by and landed on one of the domes and fire watchtower. "Seeing the five condors was an incredible experience and historic," said astronomer Elinor Gates. 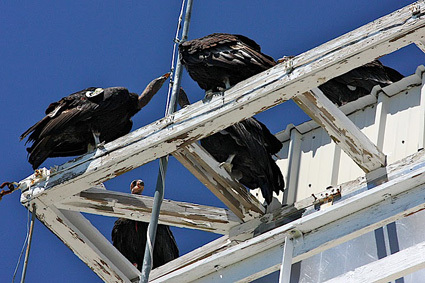 "Their talons clattered on the metal roof as they walked around." Resident golden eagles and turkey vultures looked small in comparison, she said. 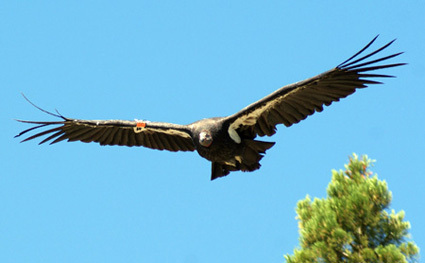 California Condors have a wingspan up to 9½ feet and nearly became extinct. Still classified as endangered, the birds are staging a comeback as the result of breeding programs in the Pinnacles National Monument and along the Big Sur coast. Condor experts speculated the Mt. Hamilton visitors were a flock of relative youngsters who usually hang out in the Pinnacles.